Netflix Streaming On PS3 By Tomorrow! Your free instant streaming disc for PS3 should arrive by Friday, Nov 06, 2009. Meanwhile, add TV episodes & movies to your instant Queue now so you're ready to watch instantly when your instant streaming disc arrives. So there you go. 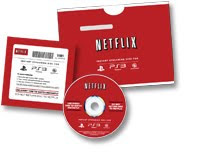 By tomorrow, all of us who have registered for the free PS3 streaming disc for Netflix will be able to start doing what they already have been doing for a year on the Xbox 360, but without having to pay for a XBL Gold account to do it. Damn, that is pretty friggin' awesome. I'm crossing my fingers that it is a Blu-ray disc, however. Why, you may ask? Well, my first run 60gig PS3 stopped playing anything other than Blu-ray discs recently. Cross your fingers and toes for me, will you?